The week before school started I decided to make use of the last few days of freedom and take Isla to Chessington World of Adventures for the day. We'd been given 4 tickets to the theme park and we went with my sister and Cousin M. The girls love hanging out together and it gave me and my sister a chance to catch up too! The beauty of going to a theme park when most of the kids are at school is that it's very quiet and you get to go on all the rides you want to and see all the animals too! We didn't do that well with the weather, it rained a fair bit but it didn't spoil our fun. When we got there we took a good look round the animals that are closest to the entry gates. Most impressive were the gorillas and tigers. Next we decided to go on a couple of rides and the great thing about Chessington is that it does have plenty for 3-4 year olds as long as they're accompanied by an adult. We braved the little pirate ships and then took it easier on the carousel. I was keen too avoid a repeat of the Cranky episode at Thomasland a few weeks back! Following that we went on Professor Burps Bubbleworks, a ride I remember from new when I used to work at Chessington many moons ago in my summer breaks from University! Unfortunately it broke down while we were on it and Isla did seem a little bit spooked by the fantasy nature of the ride. Cousin M liked it though. 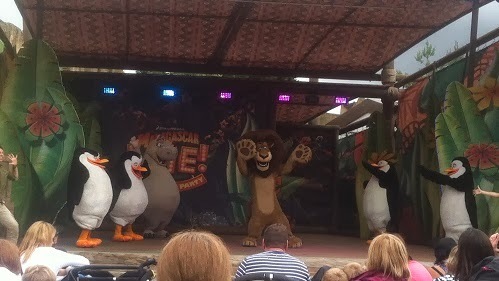 After lunch we caught the Madagascar Live show, which was great! It's an outdoor theatre and the rain held off long enough for us to see the show, I think it lasted half an hour, and then we ran for cover! Isla was dancing along and was desperate to be picked to go up on stage to do limbo! She got over that disappointment quickly though and carried on jumping around! As it was raining pretty heavily we made our way to Tomb Blaster which is an indoor ride. However Isla decided it was a scary one without even going on it so Cousin M and my sister went on without us and said it was good. The rain had stopped again so we went to Zufari, a brilliant new Safari-esque adventure! I didn't realise what we were getting into before we entered Zufari, so when we got in the truck and set off on our bumpy 'safari' ride I hadn't realised we were going to get close to the animals. I have a real soft spot for Giraffes and it was so cool getting near them. The girls really liked the Giraffes and pinched their noses together when close to the Rhinos' - boy they ponged! The terrain was really rough and it did feel like off roading, we liked that a lot. In conjunction with the new Zufari ride, Chessington has now employed a 'Birds and the Bees' consultant. She'll be there to explain to the children about animal baby making, which is quite handy indeed when you're a parent like me that gets a bit lost for words when caught on the hop with some of the questions that Isla asks! Isla and Cousin M really enjoyed this whole experience. The only thing I would say is make sure you check the height of your child on entry to Zufari, as there is a minimum height requirement and we did see a little girl turned away, so check to avoid disappointment. We finished up by watching the end of the penguin feeding presentation (really interesting!) and then a ride on the flying elephants, the jungle bouncers and a couple of goes on Toadie's Crazy Cars in the pouring rain. All in all, we had a really great day out. 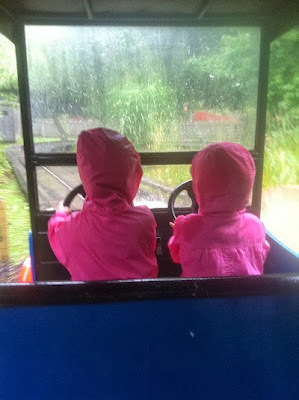 The rain didn't dampen our spirits, we just donned our waterproofs every now and then and took cover when we needed to. We had two very happy and worn out little girls by the end of the day. We were given 4 tickets to Chessington free of charge. All words and opinions are my own. Thanks for a really great day! Its been a while since we've to Chessington. Actually the last time it was before kids. It will be on our list for next Summer, as both kids will be older by then.